After, Within the Woods, The Evil Dead, and Evil Dead II comes Army of Darkness, which is actually the first of the series I watched. My friend had it taped off the Sci-fi channel (now Syfy), so I think this was actually my first time seeing it uncensored. Not that much is. Before I even knew there was an Evil Dead series, I'd seen this. I've seen it more times than any of the other three and it'll always have a special place in my heart. "It got into my hand, and it went bad, so I lopped it off at the wrist." Army of Darkness (1992) is the third in the now classic Evil Dead series. "Alright, who wants some, who's next? Huh? How 'bout it?" Ash has been sucked back in time and made a slave by King Arthur. Accused of being one of Duke Henry's men, Ash is thrown into a pit with some deadites. After fending one off, the castle wise man, believing Ash to be the chosen one, throws him his chainsaw. Ash slays the deadites, escapes the pit, and frees Henry and his men. Unfortunately, the wise man tells him that he must retrieve the Necronomicon in order to return to his own time. "See this? This is my BOOM stick. It's a 12 gauge double barreled Remington. S-Mart's top of the line." This movie is full of camp, puns, and cheezy one liners; it is also damn entertaining and irresistibly charming. It is literally so quotable that they based a successful video game franchise off it. So many that they filled all the transitions in this review and they're just Ash's (both good and bad admittedly) and I still left off some. The story is fairly simple, but so chock full of humor that you let it slide. It is also surprisingly steampunk. "That's right, shop smart, shop S-Mart. YOU GOT THAT!?!" Ashley "Good Ash" Williams has finally become awesome enough to defeat the deadites, but he's had the nice guy driven out of him. In this film, he must reconnect with his humanity after his several night torture by the deadites. We also get to see where Ash came from before the cabin and the Necronomicon. Sheila is Ash's medieval love interest. She is the person who finally gets through to Ash and makes him see that he's being selfish. Unfortunately, she plays the damsel in distress role for most of the movie and isn't very interesting on her own. The Blacksmith makes armor, hands, and repairs cars. He's the ultimate in silly camp and largely silent performances. "I'm bad Ash and you're good Ash. You're a good little two shoes!" The Lords and Villagers represent humanity's constant conflict even during severe threats. Their conflict prevents them from defeating the deadites and it is only through Ash's intervention that they unite. The interesting part is that when the conflict finishes both leaders decide to unite; even though, the threat no longer exists. "Good. Bad. I'm guy with the gun." Bad Ash is a split off twin of Good Ash. Naturally the only one who could even rival Ash at this point is himself. Bad Ash is every bit the sarcastic, womanizing badass that good Ash is, but without the humanity or spirit. "Woah, waitaminute, the words, right right right, say the words, Klaatu Barada N- Nectie, Nectar, Nickel. Noodle, it's an N-word, definitely an n-word." Several moments are mirrored from the first two films: making the mechanical hand, the initial dismemberment of bad Ash, and the burial of bad Ash. The music takes a huge leap forward with Danny Elfman composing the main Army of Darkness theme. The effects in this film can be a bit spotty. There are some really incredible scenes during the graveyard and battle especially, but there are some noticeable rushed areas with obvious fake bodies. The castle, windmill and Bad Ash look fantastic though. "Look maybe I didn't say every little, tiny syllable, but basically I said 'em, yeah!" Ash vs. the Army of Darkness, duh. We also see a satisfying end to Ash's tale with room for more. 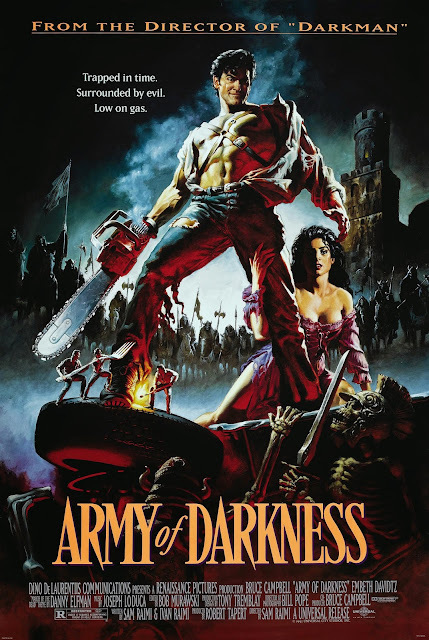 Army of Darkness tells a fantastically funny hero's journey. While it may lack in scares; it was made as a comedy, and it succeeds as a comedy. The practical effects are phenomenal, especially on the budget they had. I'd recommend it to anyone who loves comedy. Check out DC's review! Next time: Evil Dead, the Remake. Ugh.